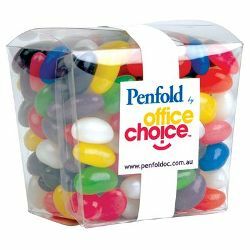 190 grams of assorted colour mini Jelly Beans in Clear Mini Noodle Box. Statutory information sheet included. ITEM SIZE(MM) Top - 74L x 64H x 50D, Base Dimensions 60L x 46H. PRINT AREA(MM) Deluxe - Die Cut Label - 30L x 30H, Band - 15L x 170H, Standard Label - 50L x 50H, 45Dia. LABEL SIZE (MM) Deluxe Label - Logo Area - 30L x 30H, Band - 15L x 170H, Standard Label - 50L x 50H, 45Dia.